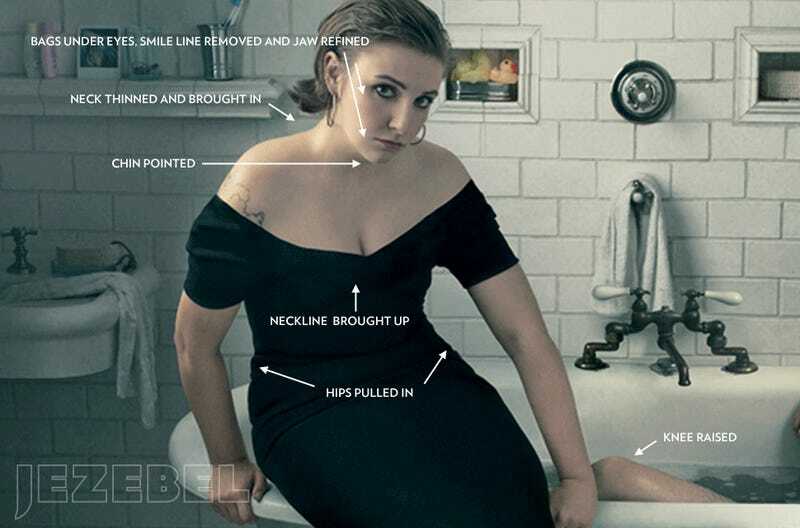 Earlier today we revealed what Lena Dunham's Vogue shoot looked like before they unleashed the Photoshop, and now she's responded. I understand that for people there is a contradiction between what I do and being on the cover of Vogue; but frankly I really don't know what the photoshopping situation is, I can't look at myself really objectively in that way. I know that I felt really likeVogue supported me and wanted to put a depiction of me on the cover. I never felt bullied into anything; I felt really happy because they dressed me and styled me in a way that really reflects who I am. And I felt that was very lucky and that all the editors understood my persona, my creativity and who I am. I haven't been keeping track of all the reactions, but I know some people have been very angry about the cover and that confuses me a little. I don't understand why, photoshop or no, having a woman who is different than the typical Vogue cover girl, could be a bad thing. Yes, having a woman who is different than the typical Vogue cover girl is indeed a good thing. What is not a good thing is when the magazine decides to take that woman and tweak her appearance enough such that she's "acceptable" for the cover. It undermines the decision to feature that individual in the first place. Also: "A depiction of me" — depiction. That word choice is telling, and it's also the problem. Yes, Vogue is fantasy. But no matter how fantastic the clothes or the setting or the lighting, the people in these images are real — and yet Vogue has to take the reality of a human being's body and make it part of the fantasy too. It's escapism, absolutely, but the message is clear: while you dream of wearing that gorgeous dress, you should also dream of physical perfection as defined by Vogue.